Down a Path of Epigenetic Destruction: Smoking Cigarettes Adjusts Critical Marks on DNA | What is Epigenetics? You can now add “harmful changes to your DNA” to the long list of reasons to quit smoking cigarettes, along with lung cancer, coronary heart disease, increased risk of death, stroke, chronic lung disease, decreased immune function, infertility, and the fact that smoking harms nearly every organ in the body. Researchers at the Johns Hopkins Kimmel Cancer Center recently contributed to the growing evidence that demonstrates that smoking cigarettes – which contain a deadly cocktail of over 7,000 chemicals – can adjust epigenetic tags on your DNA and set you on the path to lung cancer. Using actual human airway cells grown in a laboratory, the group discovered that exposure to cigarette smoke triggers epigenetic changes that are consistent with the earliest steps towards developing lung cancer. Their results were published in the September issue of Cancer Cell. Epigenetics is a field in science that has received increasingly more attention, especially since many scientific papers on the topic link peoples’ everyday experiences with harmful, as well as beneficial, consequences to their health. Epigenetic alterations occur to DNA without adjusting the underlying genetic code – the A, C, G, T bases to the “code of life.” Sometimes, these consequences may even extend to the next generation and possibly beyond. Epigenetic chemical marks can attach or detach from certain areas on human DNA, in various cells and tissue throughout the body. This leads to the production or reduction of important proteins and agents that are responsible for biological processes that keep our bodies running as they should. Epigenetic modifications are a part of normal, healthy human functioning, but when the addition or removal of marks goes awry because of lifestyle choices like smoking, it can lead to devastating health issues. Sadly, smoking kills half of those who don’t quit, according to the FDA. “Our study suggests that epigenetic changes to cells treated with cigarette smoke sensitize airway cells to genetic mutations known to cause lung cancers,” said Stephen Baylin, M.D., the Virginia and D.K. Ludwig Professor for Cancer Research and professor of oncology at the Johns Hopkins Kimmel Cancer Center. Epigenetic changes caused by smoking cigarettes can lead someone down the path to poor health and even death. Previous research has connected smoking cigarettes with a distinct epigenetic signature and has been shown to harm a child’s development. It was even crowned the most dangerous lifestyle activity in an epigenetic mortality risk profile in which patterns of epigenetic marks give clues to an individual’s risk of death. Smoking is not only guaranteed to harm your own health, but it could also put your future children at risk for diseases, health complications, and death. For men, smoking cigarettes has been linked to erectile dysfunction and diminished sperm quality, which increases the risk for birth defects and miscarriage and could prevent a man from having children altogether. According to Narendra Singh, associate professor at the University of Washington, Seattle, “At age 25, only 5 percent of a man’s sperm has DNA damage; by age 35, that percentage has grown to 20 percent.” A man’s ability to conceive with his partner declines naturally with age and, coupled with DNA damage that occurs as a result of smoking, it could severely limit a couple’s ability to have a baby together. For pregnant women and their children, the consequences of smoking cigarettes have been well-documented: premature birth, low birth weight, stillbirth, asthma, learning and behavioral disability, and predisposition to disease. Smoking can double or triple the risk of sudden infant death syndrome (SIDS), which is when a seemingly healthy baby under one year old unexplainably dies, typically while he or she is sleeping. In addition to the significant effects cigarette smoking has on the development of children, it is the number one risk factor for lung cancer. Unfortunately, just because you may not smoke doesn’t mean you are in the clear – even children and adults exposed to secondhand smoke who are not smokers themselves are at risk of lung cancer, stroke, and heart disease. Furthermore, the U.S. Surgeon General has reported that living with a smoker can increase a nonsmoker’s chances of developing lung cancer by up to 30 percent. Baylin along with Johns Hopkins scientist Michelle Vaz, Ph.D. and their colleagues began growing human bronchial cells that line the inside of our lungs. For 15 months, the scientists bathed the cells in a liquid form of concentrated cigarette smoke, which is comparable to smoking one to two packs a day. The team recorded the molecular, epigenetic, and genetic changes of the cells over the course of the study. They also compared normal bronchial cells which had not been exposed to cigarette smoke. Something called reactive oxygen species, also referred to as free radicals, are found in cigarette smoke and cause DNA damage in cells. In the smoke-exposed cells, the group found that DNA damage responses were increased due to reactive oxygen species just 10 days after the beginning of the experiment. Between 10 days and 3 months, the cells exposed to smoke contained two to four times more EZH2, an enzyme that dampens the expression of genes. Certainly, dampening the expression of genes that function to keep cancer at bay would be disastrous. Baylin and other researchers have previously shown that EZH2 and its effects are indicators that come before abnormal DNA methylation in genes. 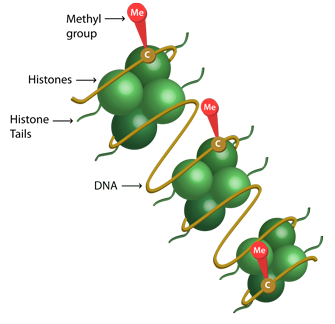 DNA methylation is a popular epigenetic mechanism that entails the addition of a methyl group (CH3) onto DNA. This modification reduces the expression of genes. In the case of cancer, DNA methylation found on tumor suppressor genes can halt the production of important agents that suppress tumor growth, ultimately leading to cancer. Alternatively, when methyl marks are removed from oncogenes, tumors can begin to grow rapidly because the gene is no longer repressed by methylation. Cigarette smoking is just one lifestyle activity that has the power to adjust these methyl marks. DNA methylation has the power to turn genes on or off. Credit: www.epigentek.com. The researchers found that following an increase in EZH2 enzymes, their levels eventually tapered off. That’s when they discovered two to three-fold increases in DNMT1, which is a protein that maintains DNA methylation, at the “start” location of numerous types of tumor suppressor genes. When methylation is increased at these sites, there can be uncontrollable growth of cells – a hallmark of cancer. Chronic cigarette smoking tends to also block genes that control cell growth and maturation, especially during important stages of development like embryogenesis. The genes should be turned on when cells need to stop growing, but smoking prevents this, said Baylin. Ten to 15 months in, the impact of the two methylation-regulating enzymes – EZH2 and DNMT1 – was still seen. At this time, the group found that hundreds of genes in the smoke-exposed cells had decreased expression. These genes included key tumor suppressor genes such as SFRP2, BMP3, and GATA4. In addition, they uncovered a five- or-more-fold increase in the signaling of the KRAS oncogene, which is often mutated in smoking-related lung cancer. However, the team found no mutations in the KRAS gene or the tumor suppressor genes during the period of exposure. Baylin explained that these silenced and abnormally methylated genes would have blocked the boost in KRAS signaling if the genes were properly activated under smoke-free circumstances. 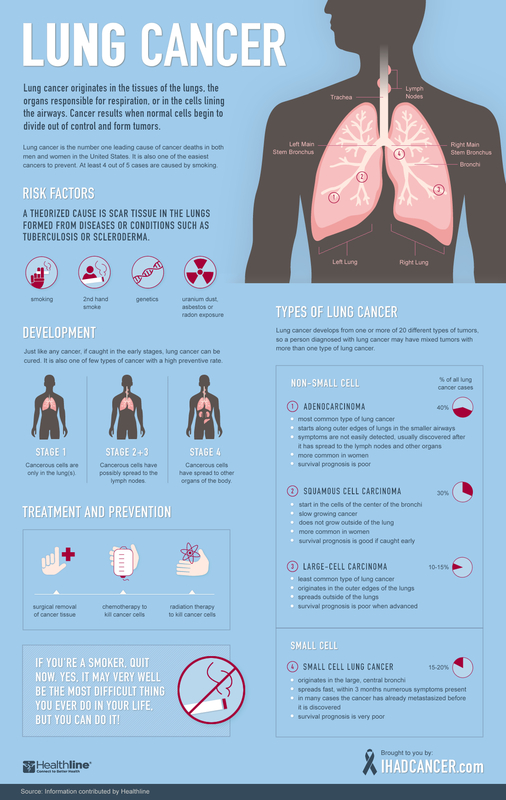 In addition, timing of genetic and epigenetic events may hold the key to the development of lung cancer, according to the scientists. They inserted mutations into the KRAS gene in the DNA of cells exposed to the cigarette smoke at two time points – 6 and 15 months. The human bronchial cells were indeed transformed into cancer, but only at the 15 month mark, where DNA methylation was fully established. Cancer was not yet found to be formed in the cells exposed to smoke for 6 months. The results suggest that chronic cigarette smoke exposure that triggers early epigenetic changes can build up as time goes on and make the airway cells increasingly sensitive to responding to mutations that start cancer. Smoking could take you down an epigenetic and genetic path of destruction. Previous studies conducted by The Cancer Genome Atlas group have demonstrated that the types of abnormal methylation levels are lower in smokers who have quit for more than 10 years compared to those who have not quit. Ultimately, scientists are finding that our behavior and our environment have an immense power on our health via epigenetics. Armed with knowledge, willpower, and helpful resources, around 1.3 million smokers are able to quit each year. 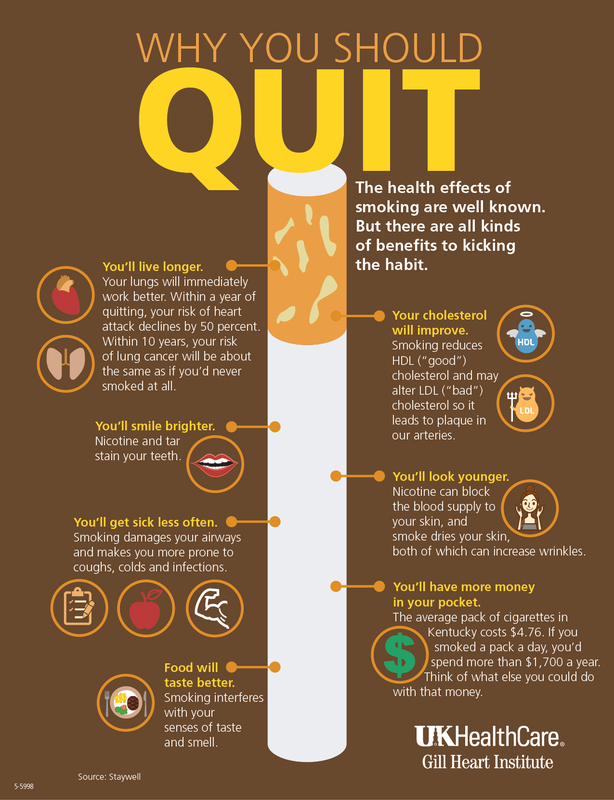 There are all kinds of benefits to kicking the habit (click to enlarge). Credit: UK Healthcare. Since nicotine is considered an incredibly addictive substance, it can be difficult for many to refrain from putting a cigarette to their lips, even if someone wholly understands the detrimental health consequences. Luckily, the body begins to regroup mere minutes after putting an end to the habit and nicotine withdrawal is short-lived, lasting usually less than a week. According to Cancer.gov, smokers who quit before age 40 reduce their chance of dying prematurely from smoking-related diseases by nearly 90 percent. After a year without a cigarette, a former smoker’s risk of heart disease is cut in half. For people with higher than normal risk for lung cancer, demethylated drugs are being considered as a treatment option for those plagued with this addiction. These pharmaceuticals are currently being tested in clinical trials for various cancers and pose an interesting new possibility. As more and more epigenetic studies are conducted, we can see just how critical our habits and behaviors are to our epigenome and how much they impact our health. Even more, our choices do not only affect ourselves in terms of increased risk of diseases like lung cancer, but novel epigenetic research is showing that they could also harm our children before they’re even born. 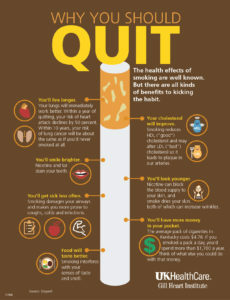 Please share your own experiences in the comments below to help others trying to kick the habit! Source: Vaz, M. et al. (2017). Chronic Cigarette Smoke-Induced Epigenomic Changes Precede Sensitization of Bronchial Epithelial Cells to Single-Step Transformation by KRAS Mutations. Cancer Cell, 32(3):360. Reference: Johns Hopkins Medicine. ‘Epigenetic’ Changes From Cigarette Smoke May be First Step in Lung Cancer Development. News and Publications. 11 Sep 2017. Web.